A sunset portrait of the bride and groom on their wedding day at the Garden of the Gods Club and Resort in Colorado Springs. This romantic and chic wedding, designed by A Vintage Affair, had beautiful views of the red rocks at Garden of the Gods and of the Rocky Mountains. 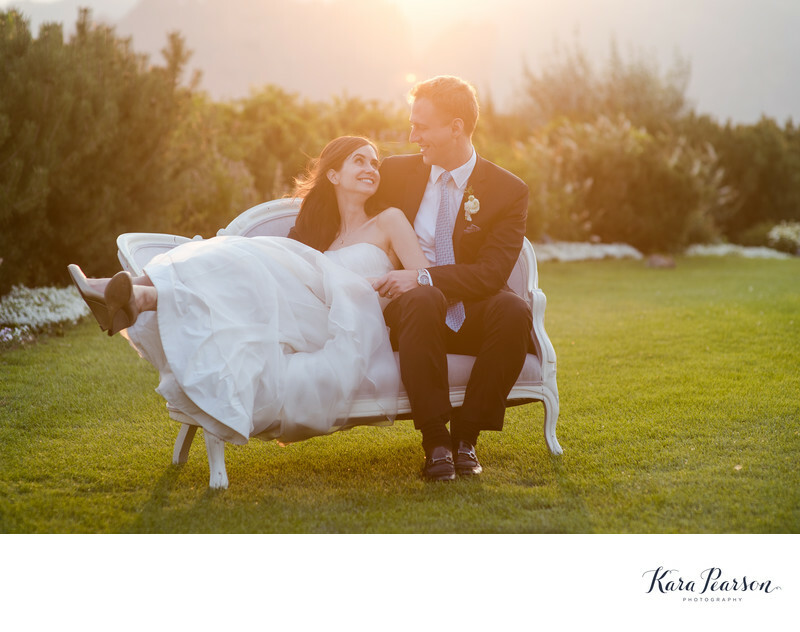 The sun set behind this couple as I posed them on a white couch out in the middle of the lawn. She snuggled up with her groom as he embraced her and then happened to look up at him adoringly. This image gives a feeling of love, warmth and security. I chose this time of day because toasts were finished, the sun was setting and there was a lull in the reception action. The late summer sun creates beautiful golden sunsets. I always want my couples to just be in the moment as opposed to feeling like they are models at a shoot. Of course I pose them, but then they end up doing their own thing which is what creates those intimate moments. The Garden of the Gods Club and Resort is a wonderful venue that allows guests to stay at the property, thus ensuring a fun, safe time. Colorado Springs has many popular wedding venues that are sure to be a great fit for any couple getting married. For this image, I used my Nikon D750 and 85mm F/1.4 lens. Location: 3320 Mesa Road Colorado Springs, CO 80904.